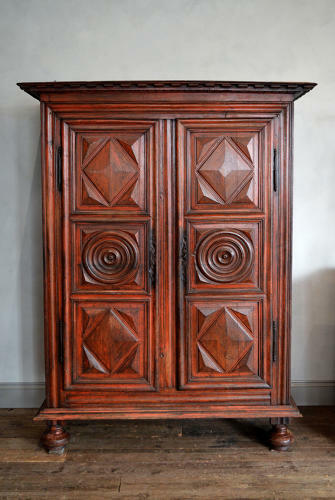 Mid 18th Century Louis XIII style Guerande armoire, 2 door divided into three panels with a geometric decoration. The lower and upper panels have a diamond pyramid pattern, confined by four triangles, "pointe de diamant". The central panel is decorated with a concentric disc. Denticuled molded cornice. Original round balled feet. Original local 'sang de boeuf' painted finish, this was believed to have protected wood from the fine airborne dust like salt that plagues the region. Now beautifully worn and waxed from 250 years loving care. This style of armoire is very distinctive to the Guerande region, this particular armoire was brought from inside the ancient walled town itself from a family that has had it for generations. This is likely the first time this armoire has been outside those city walls in it's lifetime. The old gentleman selling up sadly had no family to leave it to.